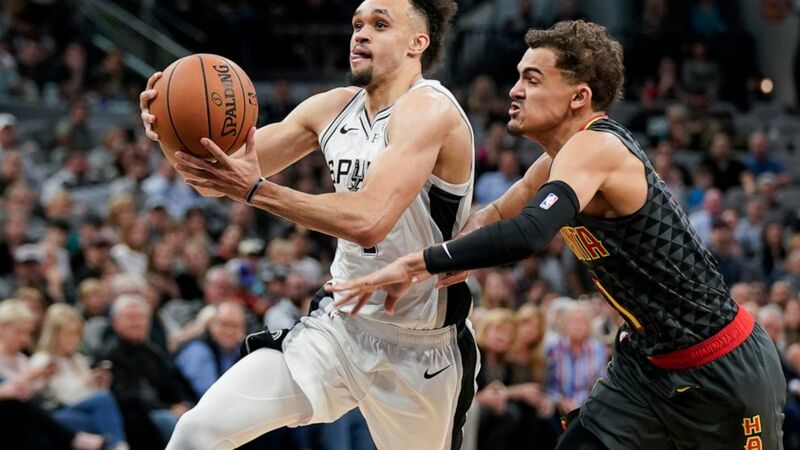 Derrick White’s ascension into the starting lineup and the pivotal role he has played in helping San Antonio earn its 22nd straight postseason appearance was a greater surprise to him than anyone else. To hear his teammates and coach Gregg Popovich tell it, the soft-spoken kid not only belongs in the spotlight, he commands it. The second-year point guard who did not receive a single scholarship offer from a four-year institution coming out of high school is about to step onto an even bigger stage: His first postseason start comes Saturday in his native Colorado as the seventh-seeded Spurs take on the second-seeded Nuggets in Denver, not far from where he played high school ball in suburban Parker. He averaged 8.2 points, 3.2 rebounds, 4.2 assists, 2.2 steals and only one turnover as the Spurs split their four-game season series against the Nuggets. A year ago, White had wrapped up a successful season with the Spurs’ G League affiliate in Austin and would remain on the bench for most of San Antonio’s first-round loss to Golden State. White watched as Dejounte Murray closed an impressive first season as the Spurs’ starting point guard after replacing Tony Parker, who was still having an impact off the bench for San Antonio. White was hoping to earn more minutes this season after averaging 23 points and seven assists for the Spurs’ summer league team in Las Vegas. It was the same drive he demonstrated in transferring to Colorado after spending his first three seasons playing for Division II Colorado-Colorado Springs to improve his draft stock. Then came July: San Antonio traded Kawhi Leonard and Danny Green to Toronto for DeMar DeRozan and Jakob Poeltl, shifting the team’s look on the wing. Parker left in free agency — and then Murray suffered a season-ending knee injury Oct. 7 in a preseason game. Suddenly the point was wide open for the taking. He has done more than help. White has become a vital part of the team, averaging 9.9 points, 3.3 rebounds, 3.2 assists and only 1.4 turnovers in 25.8 minutes per game. DeRozan called White “awesome” and All-Star LaMarcus Aldridge has enjoyed his finest overall season with the Spurs, including the first 50-point game of his 13-year career, in part because of how quickly he and White bonded on the court. The Spurs like his work on the other end of the court, too. At 6-foot-4 with long arms and a wiry frame, White has drawn comparisons to Murray and Green on defense. He had a career-high six blocks against Atlanta on March 6 and a career-high six steals against Denver on Dec. 28. “I think Derrick White is an elite defender,” Hawks coach Lloyd Pierce said. White may have begun the season as an unknown, but he has now become a victim of his own success. Teams are focusing more on him now, which led to him scoring a combined 20 points over the final four games in March. He broke out of that with a 23-point game in a win over Atlanta and averaged 12.0 points as the Spurs went 4-1 in April. And the Spurs are all for that. With Beaches, Wine and Buzz, Is This Australia’s Next Hot Place? January 15, 2019 Comments Off on With Beaches, Wine and Buzz, Is This Australia’s Next Hot Place?